We are market leader manufacturer on Double Screw For Extruder. We are leading manufacturer of screw barrel for extrusion machineries. 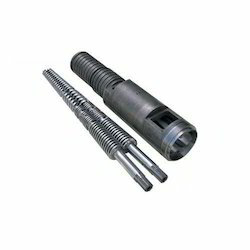 We are supplying screw in single as well as twin as per the client requirement. Made with SS316 material, it used for peanut oil extraction. completely working as per requirement. To meet variegated demands of our esteemed clients, we are engaged in manufacturing an exclusive range of Extruder Barrel Screw. We are affianced in offering our clients an outstanding quality collection of Extruder Screw (Heating Cooling). These extruder screws are manufactured using modernized technology as per the lay down norms of industry. In line with clients’ wide-ranging needs, we are providing these extruder screws in assorted specifications. With our in-depth knowledge of this domain, we are actively engaged in manufacturing an excellent quality range of Extruder Screw. We are one of the leading manufacturer and supplier of Extruder for best quality and best of price in industries. These are widely appreciated by the clients for their precise designing, durability and many other features. Our range can be availed at reasonable prices without any compromise in terms of quality. Backed with well qualified and experienced team of professionals, we are engaged in offering an exclusive range of Extruder Screws Barrels. We have in our stores for our prestigious clients an extensive range of durable and sturdy Extruder Screw. We offer Extruder Screws to our clients.